Welcome to the FIRST DAY of the 31 Days of Blogging Challenge! 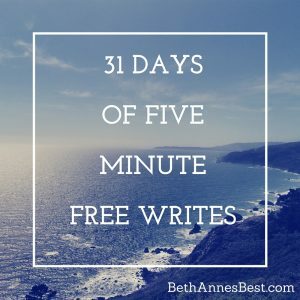 Each day I am going to be writing for 5 minutes about a different word. I’m joining a lot of the Five Minute Fridayers with a list of words over at Kate Motaung’s blog. Some people are taking the words and writing with a theme all month. I really have no theme as to what I will be blogging about in terms of the words. Basically, whatever I feel CALLED to write about that day is what will get published. I have turned off my RSS email newsletter this month so I’m not bombarding you guys with constant emails. I’m thoughtful like that. I may even change a few of the words on her list if the mood strikes or if there is another link-up or blog post I’d like to join in on. For example on Tuesday’s I like to blog with the Not Alone Series girls so I may change my words based on the topic they are writing about that week. My blog my rules and Kate said it was okay. Now that we have gotten all that housekeeping out of the way I can start this series with the first word of CALLING. In recent years a lot of people like to go around and ask, “What is your calling?” or “What is God calling you to do?” It’s a bit of a loaded question…especially when complete strangers ask you these things. There have been times in my life when I had NO IDEA where I was being called. There were times where I also didn’t feel like I was good at anything. I have always kind of felt like a mediocore person. I am VERY introverted. I don’t say much. I go to work, do my job, and leave. I don’t socialize or gossip with my coworkers and I really don’t care to. I’ve never had many friends. I played sports but was never that good at them. Like I was good enough to play on teams and get by but I didn’t get TONS of playing time and I wasn’t a superstar..although I thought I did as one of my original screen names was BSTAR (and I still use it on some things to this day) and it stood for Basketball Star that I created when I was like 10 and super obsessed with playing basketball. I also liked playing musical instruments and the piano but I wasn’t super good at them and I got bored after awhile. I think sometimes we get caught up in these fancy vocabulary words that are basically asking us what are you doing with your life? Or what do you want to do with your life? Sometimes we can’t necesarily answer those questions right here right now. We just know that we’re doing the best we can in the now and in the future we can deal with future callings. I do like to look back on my life from time to time just to see how different life was then. Like in high school or college when we worried about really ridiculous things that at that moment seemed to be “ruining our lives” but now I’m like I wish I was dealing with that vs having to worry about adulting and making doctor appointments and paying bills.